Test your knowledge with our Japanese sword quiz. There are 11 questions in all, including multiple choice, true and false and mix and match the answers. You only have 2 minutes to complete the test with a countdown timer in the corner and one extra chance to try again if you mess it up, so if you need to look the answers up online - you won't be able to complete the test in time..
And if you pass (a score of 70% correct answers or more) you get a certificate with your name on it to prove you really do know your Japanese swords! 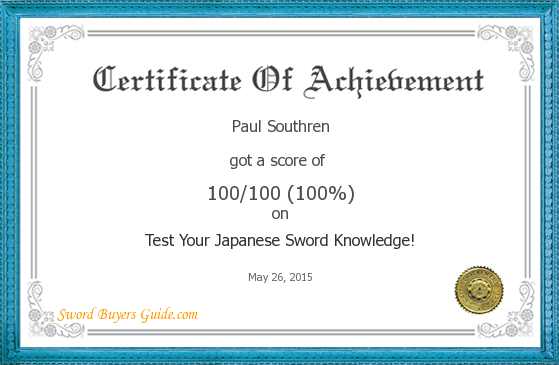 ProProfs - Test Your Japanese Sword Knowledge! Not working? Click the link above to open on its own page.